Limitations are a natural part of life, but to some they can be truly frustrating. Some people don’t like feeling held back in any way and become annoyed by the idea of having any limitations put on them. 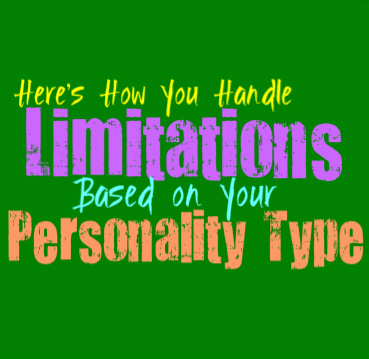 Here is how you handle limitations, based on your personality type. INFJs understand that life has certain limitations, and sometimes they are perfectly okay with this. For the INFJ it entirely depends on what the limitations are, and what it is that they are being held back from. If there is something they truly want to be good at, or something they want to go after in life, they won’t take these limitations well at all. They will become hard on themselves, wanting to find a way to overcome whatever boundaries are in front of them. If it is something they are accepting of then the INFJ won’t be bothered, since they do understand that some limitations are normal. ENFJs don’t care much for limitations, especially ones that could hold them back from their goals. For the ENFJ being a perfectionist means being able to overcome anything, as well as being skilled in just about everything. If they limitations they have are holding them back from accomplishing important goals or taking care of their loved ones, they definitely won’t handle this with understanding and acceptance. The ENFJ is likely to become truly frustrated in this situation, and will want to find a way to overcome whatever hurdles are in front of them. INFPs really don’t enjoy having limitations put on them, especially if it holds them back from something they want. While there are times when the INFP simply prefers to remain inside of their own inner minds, that doesn’t mean they are okay with their options being removed. INFPs want to have their options open to them, so that they aren’t being restrained by someone else. They sometimes become frustrated by rules and feeling contained, and want to remove these limitations. ENFPs can actually become very upset by having any limitations put on them, even the ones they place on themselves. They want to feel free to make decisions and enjoy being able to change their mind if it feels right to them. ENFPs don’t like feelings contained, and often become anxious when someone attempts to cage them. Even if their limitations come from a lack of their own abilities, the ENFP won’t enjoy this at all. They will likely try to find any way to overcome these boundaries, in order to move forward the way they want to. INTJs definitely don’t like having limitations, or having them placed on them. If they feel like they have their own limitations in certain situations, they are likely to find a way to improve and overcome them. They will do whatever they can to learn and grow, since they are often perfectionists. If their limitations are being placed on them by someone else, the INTJ will try to think this through and consider why this is happening and whether or not it should be. They will accept certain rules and limitations if it is intended for intelligent and positive reasons, but they won’t be okay with pointless boundaries. ENTJs understand that certain limitations are placed on them for reasons, but they sometimes try to find a way around this. They don’t like feeling held back, especially from things that are important to them. The ENTJ will become especially frustrated if the limitations are their own and will want to find ways to improve and navigate around this. They are perfectionists who always strive to be better at everything, and want to find ways to remove their own personal limitations. INTPs definitely don’t like limitations, since they want to have their options open. When they feel like something is holding them back or limited them in any way, they often want to find a way around this. INTPs might not taking action with everything in life, but they want to have the freedom to do so. They like having the opportunity to make their own choices, and explore new ideas and experiences in order to learn and grow. ENTPs really don’t like having any limitations placed on them, whether by others or by themselves. If there is something preventing them from exploring something of interest, the ENTP will try to find a way around it. They don’t easily accept limitations, and might even see this as a challenge. They aren’t likely to just break rules that makes sense to them, but if something seems foolish they want to find a way to make their own path in life. ISTJs don’t mind certain limitations, as long as they don’t prevent them from accomplishing their goals in life. ISTJs often have important things that they want to obtain and accomplish, and if something stands in their way it can be extremely frustrating. They seek to follow the rules and regulations around them, but they don’t like when those things get in their way. They are focused and driven people who go after what they want and don’t want anything to come between them. ESTJs don’t become upset with some limitations in life, especially if they don’t really affect them in important ways. If something does stand in their way and prevent them from accomplishing what matters most to them, the ESTJ will become very frustrated. They don’t allow things to stand in their way, and work hard to get what they want in life. Any limitations that might prevent them from getting what they desire most, is something that will frustrate and anger the ESTJ. ISFJs understand that limitations are a part of life, and won’t often become bothered by this. They are more interested in the things that matter most to them, and don’t want to get hung up on things that don’t really affect them in important ways. ISFJs care about their loved ones and simply want to protect and take care of them. If their limitations somehow prevent them from making others happy, then the ISFJ will become upset by them and want to find a way to change this. ESFJs don’t mind certain limitations, and are capable of accepting certain boundaries in life. While they are okay with limitations, there are times when this can become frustrating if it affects them closely. If their own limitations prevents them from doing something that will impress their loved ones or make them happy, the ESFJ will become truly and deeply frustrated. They care about others and simply want to make them happy, but they can also be perfectionists. ISTPs understand that limitations a part of life, but sometimes they don’t find it easy to accept the ones placed on them. They want to make their own choices, seeking to experience life the way they please. If something is limiting them from doing what they enjoy, the ISTP will want to find a way around this. They want to live their own lives with a sense of freedom and excitement, and don’t really appreciate someone or something trying to hold them back. ESTPs don’t really enjoy having limitations placed on them, since they like to make their own choices. If something holds them back from getting what they truly want, the ESTP will become annoyed and frustrated by this. They live in the moment and do whatever intrigues them most, following their own personal set of rules most of the time. If something limits them from getting something they want the ESTP will find a way around this most of the time. ISFPs really don’t appreciate limitations, since they enjoy living with a sense of freedom and openness. They want to feel capable of doing whatever they please and of living their lives in the moment. If something seeks to hold them back the ISFP can often become annoyed by this, and will likely want to break the rules in order to get whatever it is that they want most. ESFPs really don’t like limitations and oftentimes they will ignore them completely. ESFPs go after what they want in life and truly dislike anything that tries to hold them back. Whether these limitations are ones that are placed on them or ones that they have within themselves, ESFPs rarely accept these things. When they want something ESFPs don’t let anything stand in their way, and will often ignore any warnings against it.